Are you considering quartz countertops for your kitchen or bathroom? Quartz is a wonderful choice! Quartz countertops are engineered to be beautiful and sleek. Quartz comes in many styles and colors. You can’t go wrong with quartz countertops. Quartz is nonporous, durable, and evenscratch-resistant. Quartz is very hard and lasts for a very long time. The resin that is mixed with the quartz in the engineering process is what helps it become scratch-resistant and stain-resistant. Your quartz countertops will stay looking as beautiful as the first day they were installed. Because color pigments can be added to the quartz and resin during the engineering process, color possibilities are endless! You can go with a bold color and will get the same quality as any quartz countertop. Glass and metallic flecks can also be added, so you can get a great multidimensional look or a bit of eye-catching sparkle. Quartz is so versatile, and it can help you achieve almost any look you desire. Quartz countertops are not only a great choice for kitchens, but also for bathrooms. Since quartz is nonporous, it is very water-resistant. Quartz countertops are also mold resistant, which is perfect for bathrooms. All you need to do is wipe them down with a soapy cloth. Quartz cleans really well and is very low-maintenance. At The Granite Guy, we carry a large variety of quartz countertops. We can help you find the perfect quartz countertop for your style and to fit your space perfectly. Quartz is very popular, and with so many style and color choices, it is very unlikely to ever go out of style. 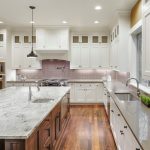 At The Granite Guy, we offer sales, design, installation, and repair of granite, quartz, and marble countertops to contractors and homeowners in the Columbus & Worthington, Ohio area. We are the home of the $40 per month granite kitchen! Granite Counters: Not Just for the Kitchen Anymore!